Class Performance » Blog Archive » Charles Wyson plays Brad Cohen’s brother Jeff? Charles Wyson plays Brad Cohen’s brother Jeff? The young Jeff is being played by a boy named Charles Wyson. You might recognize him as the boy on Journeyman, which was on NBC. 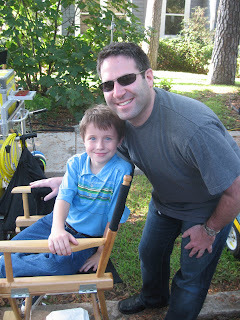 Charles was a very nice young man on the set. The scene that sticks out in my mind from the days we were on the set was when Dominic and Charles were fighting in the den area of our house and Dominic had to give Charles a wet willy. Of course this is what my brother and I did to each other often. But the funny thing about this is that they had to redo the scene so many times, Charles finally said, “Could Dominic please start giving me a wet willy in my other ear!” Of course he couldn’t because they had to stay consistent each time. 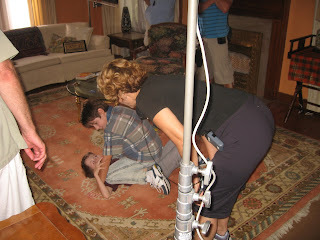 You’ll see a picture here of Charles and Dominic practicing the fight scene. My real brother, Jeff, and Charles enjoyed the time spent with each other. This entry was posted on Tuesday, September 23rd, 2008 at 5:16 am	and is filed under Hallmark Hall of Fame. You can follow any responses to this entry through the RSS 2.0 feed. You can leave a response, or trackback from your own site.